Francesco Librizzi Studio, founded in Milan in 2005, deals with architecture, interiors, exhibition and product design. Its works are focussed on the essential features of space and the way its tectonics are influenced by objects, structures and humans. Finding a balance between new interventions and the existing architectural heritage has been so far the center of the realized projects and the theoretical research of the Studio. Some projects have to be highlighted, namely some interior architectural projects as Casa C, (Domus n. 958) and Casa G, (Abitare magazine n. 538 cover project). Equally noticeable are the exhibition design for the Italian Pavilion at the XII Biennale of Architecture in Venice in 2010 and for the Bahrain Pavilion at the XIV Biennale of Architecture in Venice in 2012, hosted respectively within the spaces of the Tese delle Vergini and Artiglierie inside the Arsenale of Venice. The dynamics between architecture, interiors and objects has been outlined mainly through installations realized for cultural institutions. Among these are to be mentioned the projects for the Milan Triennale as the exhibition “Gino Sarfatti: il disegno della luce” in 2012, the installation dedicated to Bruno Munari for the sixth edition of the Triennale design Museum in 2013, and for the XXI Triennial of Milan 2016 an installation part of the exhibition “Stanze. Nuove filosofie dell’abitare” curated by Beppe Finessi. The research for spatial qualities of objects in 2016 has originated a series of products designed for Driade, by taking advantage of the experience gained in the field of interior design. The creation of volume without mass had characterized several projects, taking form by the designing “frames”. This feature has become a distinctive characteristic of the Studio and has been translated into a ratio between volume and light in a series of lamps designed for Fontanaarte. Several projects have gained great recognition and have been exhibited by international institutions, such as the Louvre Museum in Paris, the Milan Triennale and the Venice Biennale, have been published in numerous magazines and international media dealing with architecture and society, and have been awarded with prestigious prizes. Among them, the ”AZ Awards2015, Best Residential Interior”, the “Award Archmarathon 2015, Private Housing “, the “Prix Émile Hermès 2008, the Honorable Mention Compasso d’Oro 2014. Since 2008 Francesco Librizzi cooperates with universities and design academies in Italy and abroad. 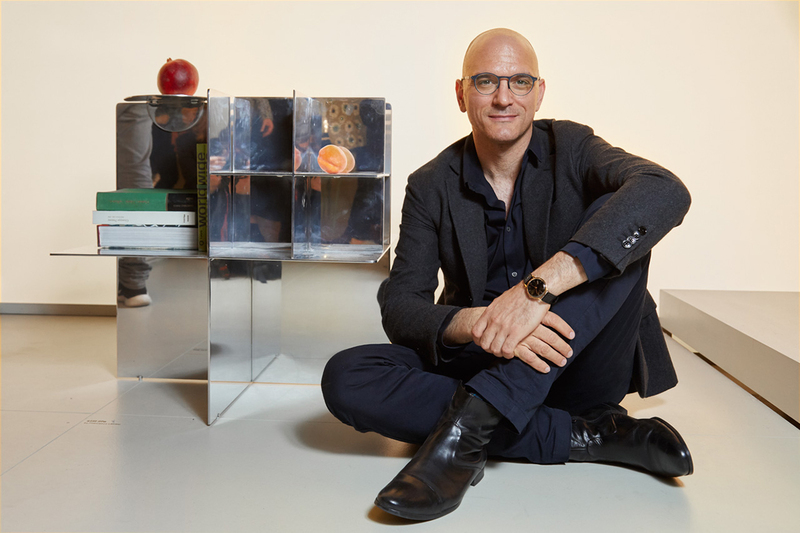 He currently holds the position of Guest Professor in Interior Architecture at the Master Interior and Living Design at Domus Academy and at the Faculty of Architecture of Genoa.